Love gives life to us as we breathe it in and then we can’t help but spread the love to those around us as we breathe it out. Jarrid Wilson, author of, Love is Oxygen, wants you to know that it doesn’t matter who you are or what you’ve done, God loves you very much! If you want to better understand God’s love and how to harness it in the way God intended, then this book is for you. We are giving away 5 copies of Jarrid Wilson’s book: Love is Oxygen. To be entered to win, make a comment below and retweet one of Jarrid’s tweets by September 30th! In the same way oxygen gives air to the lungs, love is the oxygen that gives life to our souls. This book is about Jarrid’s discovery of who God is in his life and his encounter with God’s love. For many years, Jarrid knew of God’s love and knew God loved him but had never really grasped a hold of it. It wasn’t until Jarrid was at his lowest point and didn’t want to do life anymore that he had a revelation of God’s love. He had googled, “painless ways to commit suicide” and he told God he didn’t want to feel this way anymore. That’s when he heard God tell him, “I don’t want you to feel this either.” Jarrid soon realized that God had a better life for him and thus began his journey of understanding and accepting God’s love. Jarrid wrote this book because he wants you to understand and personally experience God’s love. You are loved by God! Your life matters! You have a purpose! If you can believe these truths, it will change your life. If you think you don’t matter, you do. Have you contemplated that you have no purpose? It is not true, you absolutely do have a purpose. God loves you, not because of anything you have done or haven’t done but because He created you and loves you just because you are who you are. He made you in His image and he wants to have a relationship with you. He’s already poured out his love (as much as you need – like oxygen), now you just need to recognize it and accept it. Jarrid Wilson also addresses controversial mental health issues in his book. You can listen to our interview with Jarrid Wilson for answers to important questions about mental health. Do you want to know…? If taking medication for depression or for any other mental health issue is a sin. How churches can help people dealing with mental health issues. Or if you want to be encouraged, that it’s okay to not be okay. For more information on Jarrid Wilson’s book, Love is Oxygen, or to get a free chapter, visit: loveisoxygen.com. Jarrid Wilson is a husband, father, pastor, author of several books, founder of Anthem of Hope, and follower of Jesus. TheHopeLine wants to give a shout out to Jarrid for giving us some of his time to talk about God’s love! Win a free copy of, Love is Oxygen, by Jarrid Wilson. Make a comment below and retweet one of Jarrid’s tweets by September 30th to win! I have been following Jarrid on Twitter and have really found encouragement in the words that he tweets. It is always full of love & truth. I am very interested in his book because I’ve been through some dark times in my life and I would love to read his insight on mental health & Jesus! 🙂 I know the only things that got me through the rough times was clinging to Jesus, being in God’s word, and being honest with community. I look back at last year and I praise God for all He has done & His faithfulness. I know in those dark times He grew me to become more like Him. I am also a RN who works in the ER with many behavioral/mental health patients and would love to apply things from the book into my work setting. I know God loves me however I didn’t think that I mattered or had a purpose in this life. I’m connected to a wonderful church with great loving people who help me a lot. One thing I’ve learned is no matter where your at in life if you don’t reach out to a safe place like church, the hope line, a local Christian radio, a Godly friend or even a counselor, no one will know how you feel! Our God is a loving Father who wants the very best for His children… we just need to believe who He says He is n believe what He says about us n reach out to Him all the time! Praise him & follow His commandments!! Jeremiah 29:11 He has a plan for us…a good one!! Blessings to you all!! Amen, Shannaw! Thank you for your words of encouragement. Our God loves us dearly! Thank you for your comment, Carey Ann! 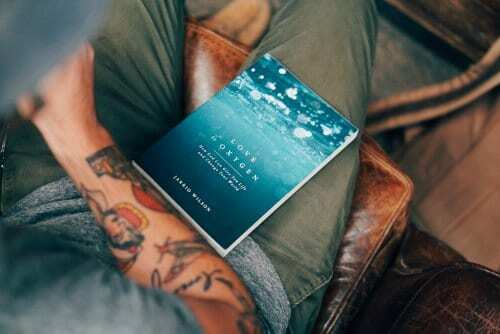 I would really like to read this book, im very intered in it, it meay help me with everything im going through. I am currently going through a divorce. And im sorry for my language but im so…up in the head to where i dont know which way is up or down im mentality and emotionally…up. And i dont know how to cope with it all because i love my husband and want him to come home which i know he wont. And this book may help me cope and change my life. Brittany, We are so sorry you are going through this. Thank you for your comment on Jarrid’s book. Jared has been an extremely helpful voice in my darkest of days. Thanks to him, The Anthem of Hope, and the Hope Line for being shining lights in the midst of deep, dark issues. Thank you for your comment and kind words, Don! Hello. This looks like an interesting book… I might have to check it out; or maybe if I am a lucky winner it will find me. I can relate to some/many of the struggles. Edward, Thank you for your comment and interest in Jarrid’s book! I need to read this book. If I win I’ll be grateful because this book might change my life. I’m still dealing with suicidal thoughts. Dorothy, Thank you for your comment. We are praying for you and hope you are seeking our resources for your suicidal thoughts. Thank you for your comment, Amanda! I feel like this book would help anyone who has been through depression, self worth, or who has gone through any forced sexual activities. May God bless Jarrid Wilson for his loving thought of his fans and may God continue to give him happiness and joy in his family through his life. Chrissy, thank you for your comment about the Love is Oxygen book!